I have been saying for years now that, in those states which by law only allow on the ballot the names of candidates qualified to fill the offices they seek; political party officers certified to election officials that Barack Obama’s name should be placed on the ballot notwithstanding no documentary evidence available in the public domain established he was Constitutionally eligible for the job and, therefore, such certification was made without verification. I first posted OUT of the MOUTHS of BABES in January 2010; it has remained one of the most popular posts on the “jbjd” blog. It describes my exchange with 9th graders in a U.S. History I class, during a lecture in which I detailed the interplay between the requirements for President found in Article II, section 1 of the Constitution; and real life, as played out with respect to the 2008 general election. Basically, I told the students that the Honorable Nancy Pelosi, then Speaker of the U.S. House of Representatives and Chairperson of the 2008 DNC Services Corporation Presidential nominating convention; ignored public requests to disclose the documentary basis for her certification that Barack Obama met the Constitutional qualifications for the job. And DNC Corporation’s general counsel, Joseph Sandler, responded to such inquiries by reminding petitioners, his was not a public agency and so, did not have to disclose the basis for that certification. The students concluded in the first instance, no one checked. In the second instance, they assumed, someone had but, did not like the results. Others have based their interminable claims that Mr. Obama’s Constitutional eligibility for President is a ‘given’ on such nebulous evidence as contemporaneous newspaper birth announcements (supposedly) available on microfilm or microfiche; or a birth certificate or certification (presumably) indexed in a government record. My response has always been to acknowledge that, I hear what others think establishes the man’s eligibility; but I want answers from party officials who are legally responsible for placing his name on my state ballot. Further, I insisted that if these often cited ‘alternative’ sources actually provided a standard of authentication; then when they were asked, those same officials would have asserted these sources as the basis for their certification. Indeed, all along I have maintained that none of those party officials who swore to election officials in a ballot eligibility state, Barack Obama was eligible to have his name placed on the ballot since he met the federal requirements of the job; had verified the truth of that certification. I have finally obtained the evidence that proves, all along, I was right. I will post this evidence in a few days, after all the ‘i’s’ are dotted and the ‘t’s’ crossed on the document for which such evidence was an integral component. I will make this brief, because ever since ALJ Malahi issued the ruling adverse to Complainants at the administrative hearing on the ballot challenge in GA; I have been swamped by disillusioned ‘Minor v. Happersett‘ ex pats now ‘willing’ for the first time to try to shift the burden of proof (and production) as to whether President Obama is a NBC, onto those people who swore he was, the seminal point in the eligibility ‘cures’ I first proposed more than 3 years ago now, before the name Barack Obama was printed on state general election ballots. 1. Attorney Jablonski, by submitting a Motion to Dismiss in which he argued the inviolate right of the political parties to choose their candidates for the state election ballot; as opposed to the party’s right to have the name of its chosen candidate printed on that same ballot; confirmed that the way to keep Constitutionally ineligible candidates out of the WH was to keep their names off the state ballot. Because political parties don’t have a right to put the names of ineligible candidates on the ballot in states that limit ballot inclusion to only those candidates qualified for the job. If your state already has a candidate ballot eligibility law; petition the SoS to promulgate emergency rules to carry out the intention of the legislation. There is no legitimate reason these cannot be in place by the time these same state officials receive the DNC Service Corporation’s Certification of Barack Obama’s 2012 nomination. The party in Georgia is over. 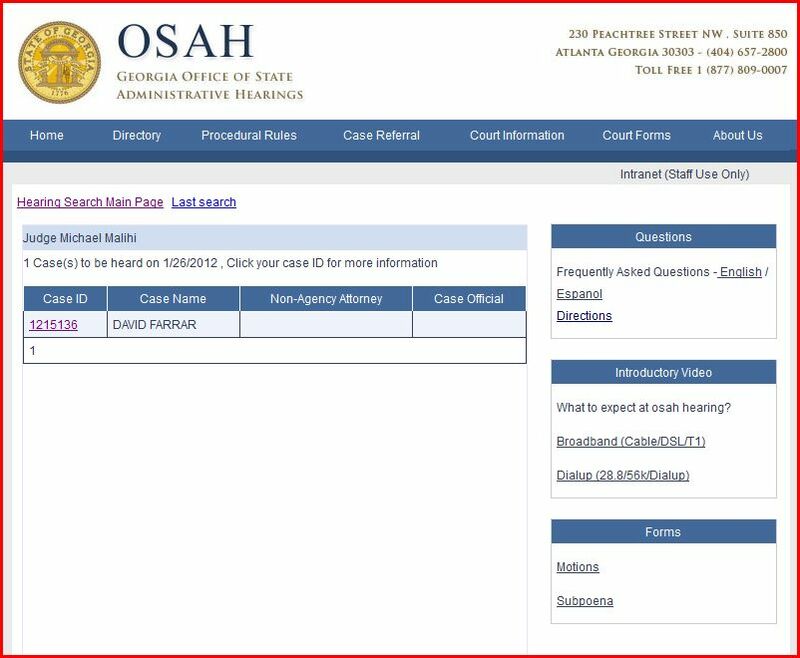 And now, having been asked several times both here and on other blogs, what I predict will be the outcome of Thursday’s OSAH hearing in Georgia before Administrative Law Judge Malihi and, further, how Secretary Kemp will proceed in light of the ALJ’s determination; I will tell you what I think. However, I am not privy to the record in this case and so, I am basing any speculation as to the posture of this case; on publicly available documentation. And I have no contact with anyone else who has privy to the record in this case (although this probably makes no difference as to the caliber of my prediction). Finally, of course, is the fact that, notwithstanding all other considerations, when it comes to predicting a decision by any ruling authority; in fact, your guess is as good as mine. RUMOR ALERT: Some people have insisted that before the hearing, the lawyers present met with the ALJ, who offered to “Default” Obama for not showing up. At that point, any one of the Petitioners – not just Farrar, who had issued a subpoena for him to appear so as to give “sworn” testimony – could have made a request to the ALJ, in the form of a motion, as prescribed by Rule 11; to default Obama. Or, the ALJ could default Respondent, sua sponte, that is, on its own. But let’s say, an ordinary citizen files a complaint with the SoS that ends up in the OSAH and the Respondent bails the fact-finding hearing. S/he is likely to look up, IN ADVANCE, how this conduct would impact the proceedings. Starting from the OSAH home page, I first found the hearing calendar and, from there, a link to Frequently Asked Questions (by parties to these proceedings). (2) “Contested case” means a proceeding, including, but not restricted to, rate making, price fixing, and licensing, in which the legal rights, duties, or privileges of a party are required by law to be determined by an agency after an opportunity for hearing. (4) “Party” means each person or agency named or admitted as a party or properly seeking and entitled as of right to be admitted as a party. (5) “Person” means any individual, partnership, corporation, association, governmental subdivision, or public or private organization of any character other than an agency. (5.1) “Record” means information created, transmitted, received, or stored either in human perceivable form or in a form that is retrievable in human perceivable form. Now, here is the Administrative rule on Default. (Again, I reached these rules through the OSAH home page.) All emphasis is mine. (1) A default order may be entered against a party that fails to participate in any stage of a proceeding, a party that fails to file any required pleading, or a party that fails to comply with an order issued by the Administrative Law Judge. Any default order shall specify the grounds for the order. (2) Any default order may provide for a default as to all issues, a default as to specific issues, or other limitations, including limitations on the presentation of evidence and on the defaulting party’s continued participation in the proceeding. After issuing a default order, the Administrative Law Judge shall proceed as necessary to resolve the case without the participation of the defaulting party, or with such limited participation as the Administrative Law Judge deems appropriate, and shall determine all issues in the proceeding, including those affecting the party in default. (3) Within ten (10) days of the entry of a default order, the party against whom the default order was issued may file a written motion requesting that the order be vacated or modified, and stating the grounds for the motion. (4) The Administrative Law Judge may decline to enter a default or may open a default previously entered if the party’s failure was the result of providential cause or excusable neglect, or if the Administrative Law Judge determines from all of the facts that a proper case has been made to deny or open the default. (5) If a party fails to attend an evidentiary hearing after having been given written notice, the Administrative Law Judge may proceed with the hearing in the absence of the party unless the absent party is the party who requested the hearing, in which case the Administrative Law Judge may dismiss the action. Failure of a party to appear at the time set for hearing shall constitute a failure to appear, unless excused for good cause. Respondent’s absence from this hearing despite an in effect subpoena to appear could have triggered the sanction of Default, but only with respect to Respondent. This would mean, the record would have been foreclosed as to him, absent a successful appeal of the Default Order. And all of Petitoners’ evidence would have been submitted into the record without objection from the other side. for a determination of the appropriate action, including a finding of contempt. Supposedly, although they have entered this same ‘evidence’ into dozens of other records, they did not want to waste this opportunity to submit testimonial evidence into this record, providing ALJ Malihi with a first-hand opportunity to gauge the credibility of their witnesses, under some mistaken belief, submitting this evidence into the record of this administrative hearing without objection from Respondent, automatically validated their submissions. Then, if they won, they could file yet another suit in a real judicial court based on ‘evidence’ certified by the OSAH (but which was outside of the scope of that forum’s expertise or authority) President Obama is Constitutionally ineligible for the job. Or, if they lost; they could use this record as the basis for an appeal filed in a subsequent judicial proceedings. Of course, they would be very very wrong. Then again, maybe petitioners didn’t end the proceedings when ALJ Malihi gave them the option; just so as not to let the cameras go to waste. At any rate, if this rumor is true that Petitioners could have moved for an Order of Default which would have been granted and which still would not have foreclosed the opportunity to provide live testimony as well as additional documentation then, these people are more incompetent than even I thought. More about that below. Now, about what actually happened and what will be the result. But the ballot challenge they presented in this case won’t work not just because they have no idea what they are doing; but because they made the wrong case. But let’s assume, in Thursday’s hearing, Petitioners had miraculously cured all of these infirmities. The question then is, what does it mean to Farrar’s ballot challenge that President Obama ignored his subpoena to appear as his – Farrar’s – witness – I already told you, that’s exactly what he did – and to bring documents that presumably would tend to support his – Farrar’s – case, after ALJ Malahi denied Obama’s Motion to Quash (that subpoena)? Here goes. Now, here is the subpoena as filled in by Petitioner Farrar directed to Respondent Obama. Notice here, Petitioner has checked off, he is both Petitioner and Respondent. And, he is commanding Mr. Obama, who actually is the Respondent; to both be sworn in as a Witness on his – Petitioner’s behalf – but also to produce the several (categories of) documents he lists to support his case. Here is Respondent’s Motion to Quash (Petitioner Farrar’s subpoena). (Notice in the caption that, he, too refers to the parties as Plaintiff and Defendant. But, he also correctly lists the SoS office as the applicable agency attached to this OSHA hearing.) Also notice that while the heading is Motion to Quash Subpoenas, plural; Respondent only addresses one Petitioner, Farrar; and mentions the only subpoena issued in this case, by Petitioner Farrar. And here is ALJ Malahi’s denial of that Motion. Notice he raises only 2 narrow grounds: failure to cite support to claim of hardship to attend; and 2) failure to establish grounds to find improper service. Interestingly, he calls the Petitioners “Plaintiffs,” and Respondent, “Defendant.” But he gets the SoS office right. Notice that he copies the plural Subpoenas in his heading. But, for some reason, he lists all Petitioners in the caption, whereas by this time, the cases had been severed. of Article 4 of Chapter 18 of Title 50 or Rule 37. So, when Respondent/Witness (Obama), ignoring a subpoena still in force; absented himself from these proceedings; in what way did this failure to appear impact Petitioner’s case? In other words, just because he didn’t show up; did Farrar win? Well, that depends on a lot of things, including who bears the burden of proof. That is, in a proceeding the purpose of which is to obtain a (non-binding) recommendation from the ALJ to the SoS to take Obama’s name off the ballot; did Farrar need to prove, he is not a NBC? Or did Obama need to prove he is a NBC? Or, did the SoS need to prove it had acted in accordance with existing rules and regulations with respect to preparing the ballot? Let’s look at the Administrative Rules. 616-1-2-.07 Burden of Proof. Amended. involves an agency action reducing, suspending, or terminating a benefit. that law or justice requires a different placement of the burden of proof. Petitioners’ original complaint is that SoS Kemp should not have allowed the name of Barack Obama on the GA D Presidential preference primary ballot because under GA law, only the names of candidates who are qualified for office may be printed on the ballot; AND President Obama is Constitutionally unqualified for the job. Well, (1) says, the agency bears the burden of proof (as to why it acted as it did, in this case, determining to keep Obama’s name on the ballot). Only, the SoS, while a party; was not the named Respondent. And no one from the office of SoS was listed as participating in the hearing. But (2) says, the ALJ can shift that burden before the hearing begins. 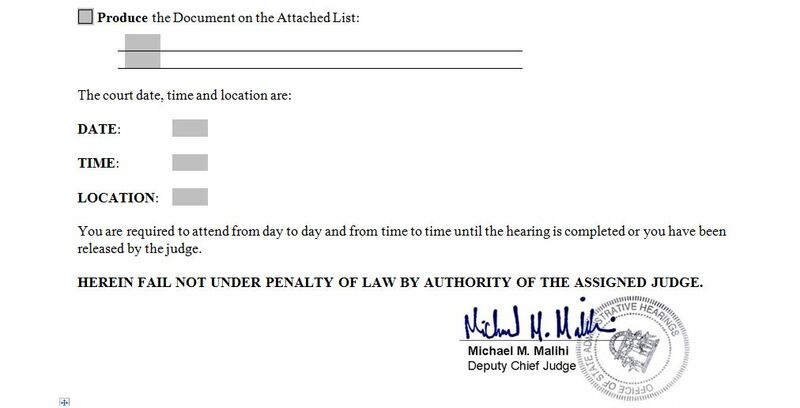 By naming Obama the Respondent/Defendant, is this what ALJ Malahi did? In other words, did he make Petitioner bear the burden of proof that Obama is not a NBC? If so, Petitioners alone failed to meet that burden. But what if the office of the SoS had been named the Respondent and, therefore, bore the burden of proof in the case? Watch this. Look at this rule on Nature of Proceedings. 616-1-2-.21 Nature of Proceedings. Amended. independent determination on the basis of the competent evidence presented at the hearing. matter available to the Referring Agency. meritorious, the Administrative Law Judge may remand the matter to the Referring Agency. Petitioners’ original complaint, supported by all of the materials they produced to make their case, is that SoS Kemp should not have allowed the name of Barack Obama on the GA D Presidential preference primary ballot because under GA law, only the names of candidates who are qualified for office may be printed on the ballot; AND President Obama is Constitutionally unqualified for the job. That was a fatal mistake. Instead – and I am borrowing this from my work on those citizen complaints of election fraud to state A’sG, in the sidebar – they should have argued this. But with the burden of proof shifted to them, Petitioners could have made their case merely by issuing subpoenas for all of those officials involved in signing the 2008 Certification of Nomination from the DNC Services Corporation swearing the then nominee Obama was “duly nominated,” that is, vetted for Constitutional eligibility under the DNC Charter; and submitting this to the GA SoS in 2008 to get his name printed on the ballot. Again, the blueprint for this argument and the evidence which Petitioners could have submitted into the record to support this argument; is laid out in those citizen complaints. Do you suppose any of the D witnesses would have shown up? Again, under the Administrative Procedure rule regarding default (above), if a default issued, this means, the ALJ has the authority to ignore any input from these witnesses. But this absence would actually speak volumes. It would demonstrate for everyone to see what we – I -have been saying all along: everyone else is willing to explain why Barack Obama is a NBC but the official members of the D party. Not when it comes to answering the question for voters and constituents – see the evidence compiled in the citizen complaints to state A’sG – and not when it comes to explaining his eligibility to an official judicial or administrative body. No reasonable person could be expected to trust the word of people who refuse to back up their word with their presence at this proceeding. Finally, GA Petitioners could have asked that the SoS immediately promulgate appropriate rules so as to ensure that from now on, only the names of qualified candidates will appear on the state ballot. An interested person may petition an agency requesting the promulgation, amendment, or repeal of a rule. Each agency shall prescribe by rule the form for petitions and the procedure for their submission, consideration, and disposition. Within 30 days after submission of a petition, the agency either shall deny the petition in writing, stating its reasons for the denial, or shall initiate rule-making proceedings in accordance with Code Section 50-13-4. And, under the timetable provided for, by law, these rules could be in place in time for the 2012 general election ballot. That’s my analysis, for what it’s worth. The bad news is, “DE-CODER RINGS” won’t be sending out any such costume baubles. But the good news is, it provides you, instead, with a ‘gimmick’ that is genuinely priceless. Because it will enable you to decipher the true nature of those familiar images which are part of the brilliantly conceived and phenomenally successful sales and advertising campaign that gave us Barack Obama, the 44th President of the United States, under various iterations including (in chronological order) “Barack Obama”; “Obama for America”; and “Organizing for America, a product of the Democratic National Committee” (“DNC”). Plus, you won’t have to send me your personal information before obtaining this Rosetta Stone. Nope; you just have to read some selected provisions of the U.S. Code. So, what is the U.S. Code, anyway? Here’s the definition on the web site of the Government Printing Office (“GPO”): “The United States Code is the codification by subject matter of the general and permanent laws of the United States.” http://www.gpoaccess.gov/uscode/ In other words, the U.S. Code is the systematic compilation of all of the federal civil and criminal laws of the land. DE-CODER RINGS is presented in two (2) parts. Part (1 of 2) addresses what the Code has to say about the legal nature of electronic political advertising campaigns like the one copyrighted and commonly known as “Fight the Smears,” and begins a discussion of the legality of posting on these political advertising sites images such as the Certification of Live Birth (“COLB”) which appears on various named internet sites carrying that ad campaign. Part (2 of 2) completes the discussion of the criminal implications of producing and distributing the electronic image of that COLB and then compares and contrasts the legal implications of presenting such an electronic image, with the laws that would apply to any future production and/or transfer of hard copy images of either an officially released COLB or an actual Birth Certificate. As you read DE-CODER RINGS (1 of 2) and (2 of 2), notice that the key to unlocking the legitimacy of political advertising, whether in the form of electronic images or hard copy, cannot be found by micro-analyzing the minutia of its visual presentation, but in realizing that the production and transfer of either electronic images or hard copy documents by anyone, whether in conjunction with a political ad campaign is likely governed by and, therefore, inextricably linked to maintaining compliance with provisions of the U.S. Code. (Here is an interesting side note. When I posted COUP (1 of 3) way back in August 2010, I posited that while only publicly unveiled in June 2008, FTS had been conceived and concocted well in advance. Advertising copy on the FTS campaign launch asserted once and for all, this electronic image of the COLB would “fight” the “smears” that the man who would be President of the United States was not a Natural Born Citizen by “prov[ing]” he is “native” born. (I know, this made no sense on its face, as the Constitutional language in that one provision pertaining to eligibility – Article II, section 1 – does not state that being a “native” “citizen” confers eligibility but only being a “citizen” who it describes is “natural born.”) I have been characterizing FTS as paid political advertising that was only designed to persuade consumers to buy (into) the product (candidate) Barack Obama. As evidence of this claim the web site is nothing more than political advertising, I pointed out the ever-changing accreditations in the footer of the site, which changing credits correspond to Obama’s altered political status – nominee wannabe -> nominee -> President-elect/President – as required by the U.S. Code. Let’s further examine the legality of what we already know about the contents of FTS, in light of that Code. But trust me, by applying just the following select sections of the Code involving political advertising funding credits, to “FTS,” you will begin to develop an understanding as to the interplay between law and practice. “azgo” volunteered this U.S. Code reference prototype to simplify your analysis. (Just a word of caution. By citing to particular provisions found in the Code, I am not claiming that these exclusively govern political campaign advertising. I merely intend to illustrate the point that, an explanation underlying the advertising copy visible on the screen, can be found in the Code.) The quoted accreditations appeared in the footer of the FTS web page, evolving along with the corresponding political status of Barack Obama, in parentheses. The provision of the Code satisfied by that wording follows. “Paid for by Barack Obama” (D Presidential nominee wannabe) = complies with § 441d. (a) (1). “Paid for by Obama for America” (nominee) = complies with § 441d. (a) (2). “Paid for by Organizing for America, A Project of the Democratic National Committee, 430 South Capital Street SE,Washington, D.C., 20003. THIS COMMUNICATION IS NOT AUTHORIZED BY ANY CANDIDATE OR CANDIDATE’S COMMITTEE” (Emphasis added by jbjd) (President-elect and President) = complies with § 441d. (a) (3). Okay, get that? Based on this rudimentary analysis of the disclosure of its funding sources, the electronic political advertising platform called FTS meets the legal requirements spelled out in this section of the U.S. Code. Yep; nothing in this section of the law requires that what is said in these publications or solicitations must be true. It just says, you have to disclose who is paying for the words. So, does this mean, the Code condones the “production,” “transfer,” or “possession” of any document incorporated into such political advertising, including a mock-up or image thereof of any documents advertisers variously claim is either an official “Certification” or “Certificate” “of Live Birth”? Hardly. Only, that’s not dealt with in Title 2 of the Code but in Title 18, Crimes and Criminal Procedure, Part I, Crimes, Chapter 47, Fraud and False Statements, §1028, Fraud and related activity in connection with identification documents, authentication features, and information. This aspect of the legality of conduct related to political speech will be covered in DE-CODER RINGS (2 of 2). The following credit communications on “’Fight the Smears” web page evolved from the time the candidate was a competing candidate to the present credit communication paid by the national political party. The communication credit from the candidate’s original campaign web site. – Complies with U.S. Code § 441d. (a) (1). The credit communication evolved to a new name when the candidate became the presidential nominee of the national party. – Complies with U.S. Code § 441d. (a) (2). The credit communication evolved to a new name when he became the presidential nominee of the Democratic party. – Complies with U.S. Code § 441d. (a) (3). The ‘Fight the Smears’ web page with the birth document image, statements and solicitations has been and is presently a paid public political advertisement which conforms to Chapter 14, Federal Election Campaigns, § 441d. THE ‘FIGHT THE SMEARS’ WEB PAGE IS A LAWFUL PAID POLITICAL ADVERTISEMENT. This is a copyright warning and consumer alert to the owners and readers of any of the following internet sites: americangrandjury; americanthinker; butterdezillion; canadafreepress; citizensagainstproobamamediabias; citizenwells; devvykidd; fellowshipofminds; freerepublic; logisticsmonster; obamareleaseyourrecords; oilforimmigration; sodahead; theconservativemonster; thedametruth; theobamafile; thepostemail; therightsideoflife; washingtontimes; and westernjournalism and and wnd (both Bob Unruh’s bloviating babies). You have been made accessories after the fact to the theft by JB Williams of original work produced by and copyrighted to me, “jbjd” and posted on the “jbjd” blog but which work he stole without my prior notice or approval and has been illegally distributing under his name ever since. Adding insult to injury, having only stolen the work but not bothered to learn what it meant, Mr. Williams misrepresented to his audience what it meant. As a consequence of his subterfuge, dozens of blog owners ostensibly motivated by their heartfelt desire to teach others about our electoral process; and hundreds of thousands of citizens ostensibly trying to learn about our electoral process by reading these blogs, have been distributing and consuming false information Mr. Williams wrongly extrapolated from my work. Worse, crediting this narrative knock-off, citizens have been traveling up blind alleys trying to figure out the fraud that tainted the 2008 election cycle when collectively, they could have been taking positive steps I already laid out to redress the illegal fraud I had previously identified, years ago now, which action would help to prevent its recurrence. In wasting their time and effort in this way, they have been paying for his crime ever since. On August 13, 2009 I posted IF DROWNING OUT OPPOSING FACTS IS “un-AMERICAN” THEN IGNORING UNPLEASANT FACTS MUST BE un-AMERICAN, TOO on my blog, “jbjd.” This article was inspired by comments from the Honorable Nancy Pelosi, Speaker of the U.S. House of Representatives, to USA Today, describing boisterous dissent at town hall meetings leading up to the vote on Obamacare as “un-American.” (“Drowning out opposing views is simply un-American. Drowning out the facts is how we failed at this task for decades.”) The article focused on the contradiction between 1) Ms. Pelosi’s Certification that Obama was a Natural Born Citizen, and Obama’s statement on “Fight the Smears” that he is only a “native”; and between 2) communications from members of Congress to their constituents claiming that Obama is eligible to be President because Annenberg Political Fact Check says he is, and the fact I exposed that APFC does not check facts, which I documented in RUMORS, LIES, AND UNSUBSTANTIATED ‘FACTS’ posted 4 (four) days earlier, on August 9, 2009. As background, I parenthetically reminded readers, saying Obama was “duly nominated” or was “Constitutionally eligible for the job” was a distinction without a difference. To show this difference, I posted images of 2 (two) DNC Certifications of Obama’s Nomination submitted to election officials in SC and HI, both of which had been available individually on the internet for more than 8 (eight) months by that time, since 2008. And, consistent with my writings on the 2008 election cycle since before the August 2008 DNC nominating convention, in which I emphasized that elections are a state by state affair conducted according to individual state laws; I repeated that the difference in wording found in these 2 Certifications was only attributable to the individual requirements of election laws passed in each state. I pointed out according to the election laws in HI, the party must explicitly write this Constitutional eligibility into their Certification. But again, this difference in the wording of the Certifications was not the point of the article. Signing two different Certifications was not a problematic ‘fact’ because as I explained, saying either “duly nominated” or “Constitutionally eligible” meant, he is a Natural Born Citizen. …They snuck it past fifty state election commissions, congress, the US Supreme Court and Justice Department, the Federal Elections Commission and countless members of the Electoral College nationwide. Not a single member of the, as Limbaugh says, “drive-by media” caught it either, or if they did, they decided to become complicit for their own political reasons. But as is always the case with liars, cheats and thieves, they slip up Ð make a silly mistake Ð overplay their hand Ð leave evidence lying around that they had forgotten about. And as with all chronic liars, they eventually get caught in their own web of lies. …Last, the fact that TWO DNC Certifications exist, both signed, dated and notarized by the same individuals on the same day, means that a very real conspiracy to commit election fraud was underway, and since it took until six months after the election to uncover it, the conspiracy was indeed successful. Immediately, the thief was confronted with the facts, readers detected his theft from my blog and opposed his wrong interpretation of the meaning and significance of these dual Certifications. How do we know? Because they told him, in writing, and urged him to refer his readers to my blog, reporting I had been working on these issues for some time, and could accurately explain their meaning in context. for the correct meaning and interpretation that he has studied for almost a year now and also how to act on it. Thanks for the article, great work. for the correct meaning and interpretation. jbjd has studied for almost a year now and also how to act on it. I was not implying that you did! I was referring to the anonymous reader that sent them to you, and the possible idea of fraud that came with it, if any. I commend you on being able to take the initiative and investigate. I am sure your readers understood that point and I thought you did too because you so generously let me post the site https://jbjd.wordpress.com/ where people can take advantage of research that has been done in this area for almost a year now. I am in no way part of that blog- just a fan. And as a fan I wanted to point to a blog where I think in my opinion is more detailed and corrects some wrong conclusions on your part and others new come to the issue. I hope you take advantage of well thought out research and possibly report on https://jbjd.wordpress.com/ work especially in the states of Hi and TX. since the report would be on jbjd there would be no issues and would be a great follow up to your column because I am sure you would agree that there are others like you concerned about fraud. The NH investigation is a red herring and will give msm a chance to say the issue has been settled even though NH has no such law. Thanks again for posting my comment about https://jbjd.wordpress.com/ and I am sorry if there was any misunderstanding.columns like yours that are concerned about fraud only want the truth and by posting my comment you showed that you cared enough to show the path to that truth. Go here, jbjd has been diligently working on this and other things for quite some time. See “MODEL COMPLAINT OF ELECTION FRAUD TO STATE ATTORNEYS GENERAL”. Please read the other posts by jbjd. The Texas chair of the Texas Democratic Party used his letterhead on practically the same letter and as jbjd has noted in the model letter to the Texas Attorney General. Texas election code requires the state political party chair to certify the names of the nominees for POTUS and “the nominees possess the qualifications for those offices prescribed by federal law”. Please note that the notary’s date of the “27 day of August, 2008”. Obviously, given azgo’s information that only Boyd Richie, Chair of the Texas Democratic Party (“TDP”) signed the Certifications that went to election officials in TX, and not Nancy Pelosi, he was wrong when he told readers, Nancy Pelosi signed Certifications in all 50 states! And he could have easily checked, because azgo also informed him, those TX documents were the basis for the citizen complaint of election fraud to TX AG Abbott I had posted on my blog and made available to readers for download and sending, free of charge. But by this time, Mr. Williams was too invested in the notoriety he had begun receiving for posting my work, to admit culpability for his crime. So, he never corrected the mistakes he had incorporated into his faulty analysis of the work I had created which he re-posted under his name. He couldn’t now post these corrections, or direct readers of his plagiarized column to my blog and the TX complaint I had posted there specifically for their use and which could prove effective against the state party chair; without giving away he had stolen his column from me! Meanwhile, all of those other sites that had posted JB Williams’ work and, like him, failed to credit me or, follow my blog, not only missed out on the truth FOR ONE WHOLE YEAR but also wasted their time and energy on a wild goose chase dependent on the differences in Certifications, instead of pursuing the mechanism I had created on my blog that would allow citizens to go after those members of the D Party who committed election fraud in applicable states. Especially hard hit was butterdezillion. In September 2010, she credited JB Williams with writing the definitive article in CFP on the 2 different Certifications of Obama’s Nomination; and she, too, repeated the lie, HI is the only state that requires explicit Certification of Constitutionality to get on the ballot. Just like the response triggered when JB Williams stole my work, now, one year later, when butterdezillion credited his theft of that same work, she, too, was bombarded with writers informing her, this was my work all along. And it didn’t mean what JB Williams said it meant. Additionally, I contacted her and demanded a retraction. Now, unlike Mr. Williams, she did alter her credits to reflect, the research that produced these Certifications was mine. (In fact, I had not originally obtained either document. The SC Certification was on the internet. The HI Certification came from Justin Riggs. I only put them side by side to visually demonstrate the differences.) (More on my collaboration with Justin later…) However, like JB Williams, as she had failed to study my work, she now incorrectly told her readers what this research means. Outstanding research by blogger jbjd here, here, here, and here, with summary here, showed that Nancy Pelosi and Alice Travers Germond , as representatives of the Democratic National Committee, had signed one Certificate of Nomination for Obama and Biden that was sent to 49 states, and another that was sent only to Hawaii. Only the certificate sent to Hawaii included a statement that Obama and Biden were Constitutionally qualified to serve as President and Vice-President. That certificate of nomination for Hawaii is the ONLY statement in this nation signed by somebody besides Obama which claims that Obama is Constitutionally eligible to be President. (Note: I am currently checking into whether the South Carolina Democratic Party also signed a statement of Constitutional eligibility. Will update later if this paragraph needs to be edited.) Contrary to arguments that Congress certified Obama’s eligibility when they certified the results of the electoral vote, neither representatives of Congress nor any Secretary of State has signed a legal document saying that Obama is eligible. This one oath by Pelosi and Germond is the only legal claim that Obama’s eligibility was verified. Not understanding my work or the context of these Certifications, she, too, invented a cottage conspiracy industry related to the mistaken uniqueness of the HI Certification of Nomination, with a twist. See, she uses the fact the DNC Certification of Nomination contains the line that Obama is Constitutionally eligible for the job; to support her argument, the HI D Party refused to put that line in their state Certification because they knew Obama is not a NBC. How does she know this? Well, she retrieved both the DNC and the HI D Party Certifications for 2000, 2004, and 2008. In 2000, the DNC document began without the eligibility line, which was obviously typed in after the original document was completed. The HDP document in 2000 contained the same eligibility line. In 2004, the DNC document did not contain the eligibility line; the HDP document did. In 2008, the DNC document did; the HDP document did not. butterdezillion points out all of the variables were the same – the election law was the same, Brian Schatz was the HI D Party Chair; and Joseph Sandler was the General Counsel to the DNC – and argues, on this basis, one would expect that the Certifications would have been processed in the same manner. Since they were not, she concludes, Mr. Schatz “refused” to swear to Obama’s Constitutional eligibility for President because he knew the man was not a NBC. Only, she is wrong. For one thing, all of the material variables were not the same. But that fact has not stopped the ‘usual suspects’ from piggy-backing on her mistakes. Even worse, her work now specifically contains a reference to research done by “jbjd,” thus arguably giving the false impression, again, my work is the basis for her soon-to-be-exposed-as-discredited findings. So instead of acting independently a month after the National Convention and confirming Constitutional eligibility as in the past, the HDP acted before the Convention to take out the eligibility language from their standard certificate, signed it, and gave it to Joe Sandler before Pelosi had signed anything – signaling to the DNC that they were not going to certify eligibility. They coordinated their efforts with Joe Sandler, who sent both documents together to the HI Elections Office. Apparently Sandler, Pelosi, and Germond all knew that Hawaii’s special certification was necessary because the HDP refused to certify Obama’s eligibility. Let me just point out one of butterdezillion’s most glaring mistaken presumptions. Joseph Sandler did not submit both the DNC and the HDP documents “together” to the HI Elections Office. (This probably explains why his cover letter only references the DNC Certification and not the HDP Certification, and why he uses the word “Certification,” in the singular.) And how do I know this? Because way back in January 2009, I asked the HI Election Office. That is, I asked Justin Riggs to ask them. See, in December 2008 I learned that Justin Riggs had been corresponding with elections officials in various states asking them to provide the paperwork submitted by the D and R parties to get their respective Presidential nominees on the general election ballot. Justin posted his paperwork. I looked at the HI documents – these are now posted on my web site, along with Justin’s correspondence – and had questions. So, I asked Justin to ask HI election officials, since he had already established a rapport. Especially I was interested in learning when they had received these Certification documents. Because among those documents I got from him were just the DNC Certification; the HDP Certification; and the HDP cover letter. Joseph Sandler’s cover letter was missing. And as you can see from the documents posted on butterdezillion, his cover letter is the only one with a ‘date received’ stamp. Mr. Sandler’s cover letter, dated August 28, was stamped received by the HI Elections Office on September 03. And that cover letter was the only one of those DNC/HDP Certification documents received by the HI Election Commission for Obama that received a Date Stamp. Consequently, as the documents I received from Justin did not contain Mr. Sandler’s cover letter, none of his documents had a stamp evidencing it had even been received by the HI Elections Office! But obviously, the documents were received, as election officials did print Obama’s name on HI’s general election ballot. (The date these documents were received didn’t matter, for the same reason, that is, I knew they had been received in time.) Just to satisfy my curiosity, I asked Justin to ask officials how they received these DNC and HDP documents. Here is his reply to me. Here you go… it looks like the HI Democratic party forwarded both documents to the Elections Office. Hope that helps. Keep me posted on your progress. Both documents were forwarded by the Democratic Party of Hawaii. Now that I see Mr. Sandler’s cover letter, Mr. Cronin’s answer makes even more sense. That is, between his use of the singular “Certification”; and the delay between the date his letter was written and the date this was received by the HI Election Office’ it would make sense that the DNC gave the documents to the HDP who then forwarded these to the HI Elections Office. When butterdezillion wrote her ‘seminal’ Certification article on September 10, 2010, she knew none of this. Thus, based on her faulty assumptions about how the DNC and HDP letters of Certification reached the HI Election Office, she asks, “The question that begs an answer is: Why did the Hawaii Democratic Party refuse to certify Obama’s eligibility as they had always done to successfully place presidential candidates on the ballots before?” And answered it with that contrived story. A more plausible answer as to why the HDP did not add the line about Constitutional eligibility in 2008 like they had in 2004 and 2000 likely could come from anyone reading the work produced on my blog. Here’s a hint: what information highlighted in COUP (2 of 3) and (3 of 3) led to my conclusion, Obama and the DNC had identified which Clinton pledged delegates were from vote binding states? Yep; it’s those state Delegate Selection Plans. As I told you, provisions in the DNC Model Delegate Selection Plan for 2006 required, in order to obtain final approval from the RBC for state delegate selection plans for use in the 2008 election cycle, state parties were required to submit those plans to the RBC accompanied by all state statutes reasonably related to the delegate selection process. (Emphasis added by jbjd.) http://s3.amazonaws.com/apache.3cdn.net/e824f455b24c7782dc_jjm6ib44l.pdf In this way, the DNC could monitor any idiosyncratic requirements in individual states so as to ensure Obama’s name would qualify to get onto every general election ballot. I assumed this provision was not included in the 2002 DNC model delegate selection rules to be used in the 2004 election, and that’s why the HI state party (and, presumably, state parties in other states) handled their special Certifications on their own. Finally, I had time to check my hypothesis; and I was right. In other words, where changes would be required in the language of the Certification of Nomination to satisfy the law of individual states, in 2006, the DNC began assuming responsibility for all such changes. And that would explain why in 2008 the HDP did not certify Obama’s Constitutional eligibility for office but the DNC did. P.S. What does arouse my suspicion in HI is the ‘coincidence’ that Mr. Schatz, Chair of the HDP, taught in Kenya and went to school there, in the early ’90’s… What are the odds?